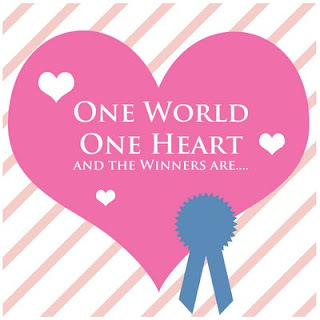 *I am thrilled beyond belief to have won your gorgeous quilt!!! Thank you so very much!! !There’s a little story behind my wishes to win your quilt when I first saw it: Hubby’s grandmother will be 99 next month. She was an artist (she dabbled in everything and excelled in most of them =)). Anyhow, in the 60’s she made a beautiful wall hanging with the word “LOVE” with flowers in the typical yellows, oranges and reds of the time. It was given by my MIL to my daughter when she was born (she’s 8 now). When I saw your quilt, it compliments the wall hanging like you wouldn’t believe! I thought – WOW! That would look awesome next to Mimi’s wallhanging! tah dah!!!! I really am doing a happy dance!!!!! 2nd place is: Katherine of Making Chicken Salad said… tamy, this quilt is gorgeous! i would love to display it on my wall. please enter me in your drawing. thank you! 3rd place is: Ann of Creative Antics said… Ooooh, gorgeous quilt! I love those bright colors! Congratulations ladies! I’ll contact you and ship after I receive your addresses. Thanks to all who entered. This has been a lot of fun and a truly interesting event. I have visited soooooooooo many amazing blogs! Sooooooooooooo many interesting and fascinating people. Thank-you Lisa, for being such a gracious host and all your dedicated work to make this a successful event. This has been a terrific ride!! We’ll see you next year! Hosted by Lisa who has done a fantastic job at organizing and hosting this event for the 3rd year. Each year this event has gotten bigger and bigger. There are over 900 participants this year, over twice as many as last year! It has taken some serious time dedication, mainly late at night, but I’ve really enjoyed visiting each and every blog this year. My entry is here and I’ll take comments until midnight Wednesday. There have been over 500 comments so it may take me a little longer to sort through and make sure everyone left an email and that the duplicates are pulled, but I will name the winners by Friday the 13th. There is still time to see everyone’s entry. Go have fun. 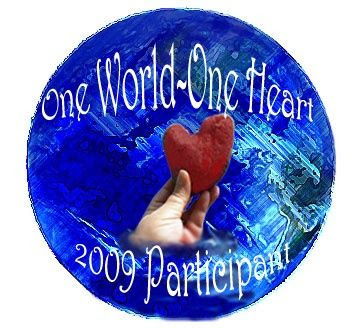 What IS ONE World-ONE Heart? It is a blog-wide giveaway event. Get aboard the Love Train. 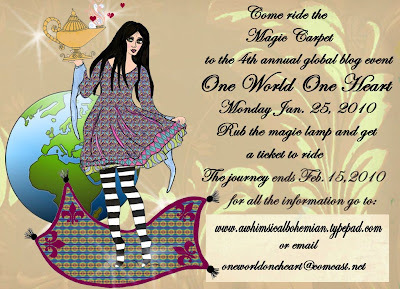 The original idea behind this was to bring bloggers together from around the world who may never ordinarily meet. It closes the gap of the blog community and enables us to interact, discover new and wonderful people, and in the process possibly win a prize or many prizes along the way. Last years event had even more participants than the first year and many, many wonderful friend connections were made because of it……friendships that are still going strong. My giveaway this year is for this colorful 3×3 wall hanging quilt. This has gotten soooooooooo big. I’m adding a second & third prize again this year. Meet and greet other bloggers, many whom you’ve not met before and see all the spontaneous generosity happening with their individual give-aways! Please leave me a comment AND a back link to your blog, so I’ll be able to notify you if you win. If you do not have a blog and would like to enter, please be sure to leave your email address in your comment. I will accept comments up to 11:59 PST February 12th. The winner will be notified February 13th. A giveaway at every blog. OWOH Begins in 2 months. Aren’t these beautiful? They’re even better in person! She sent them in a really great handmade paper envelope too. I won these during the 2008 One World One Heart event from Art In A Carton. Go on over and check out her blog – it’s great. Let me just say that I had no idea that my participation in this giveaway would result in 166 visits from Bloggers all over the world. Can you imagine how many it would have been had I joined on day 1. I will never be able to thank everyone enough for visiting and leaving such sweet comments about my blog! This has been a great experience to visit so many wonderful blogs and a chance to meet so many wonderful bloggers and crafters. I think everyone will have to agree that this is pretty terrific and befits all the time and effort Lisa put into this ~ she’s going to need the serenity. I have sent messages to everyone and will ship as soon as I have addresses. Thank you so much for visiting and I’ll see you all again next year.